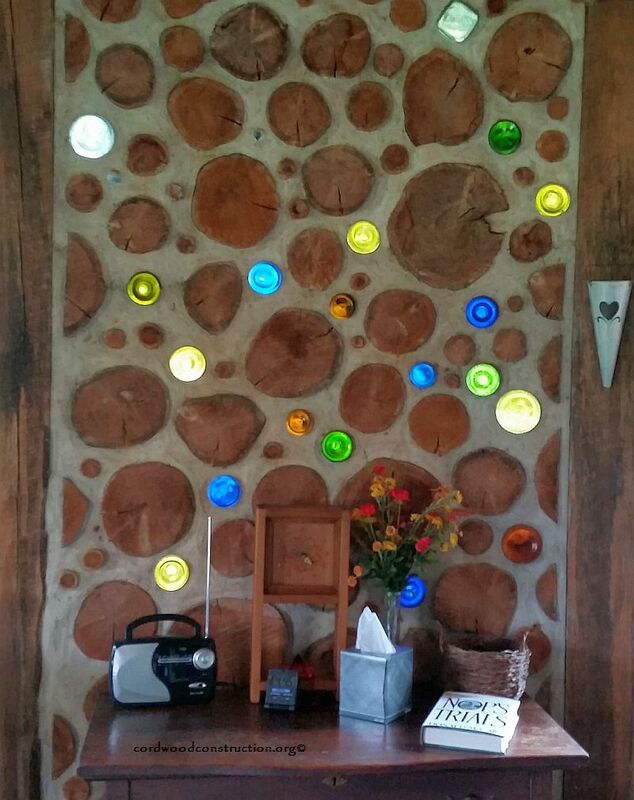 Note: This is part 2 of a two-part post about Bruce & Nancy’s cordwood masterpiece(s). 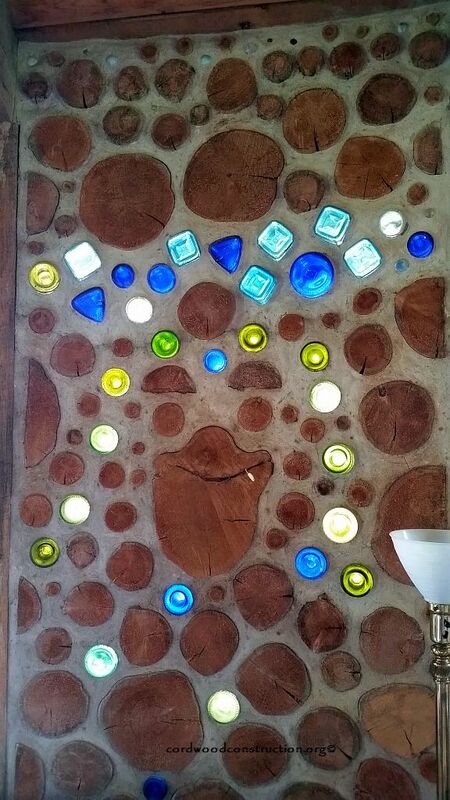 The first part is available at Most Beautiful Cordwood part 1 Before Bruce & Nancy built their cordwood masterpiece near Saranac, New York they built a storage shed and then a guest cottage. They lived in the 315 sq. ft. round guest cottage for 9 months, while they built their home. 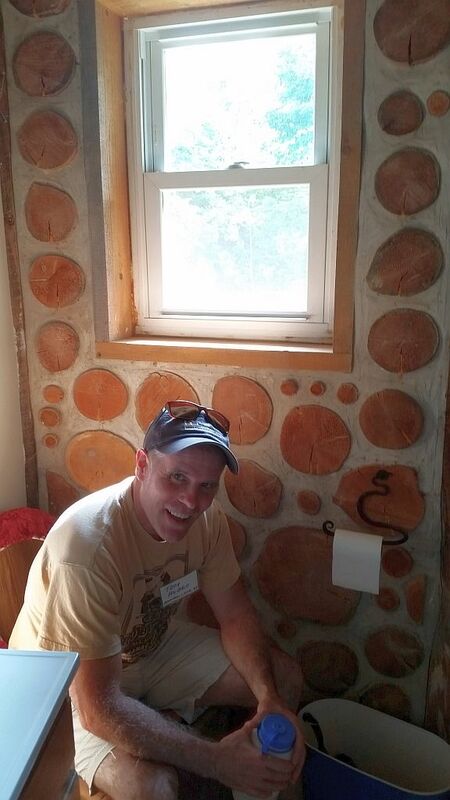 The following pictures from their most excellent home tour during the Cordwood Conference in July 2015. Bruce explains the construction of the guest cottage. 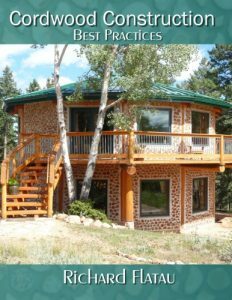 Even though the guest cottage looks round, it carries a full, hidden post framework of 6″ x 6″ timbers with 12″ cordwood infill. Bruce “hid” the posts on the inside of the wall by using his latest invention “Wraparound Log Ends.” The posts are only visible from the inside. 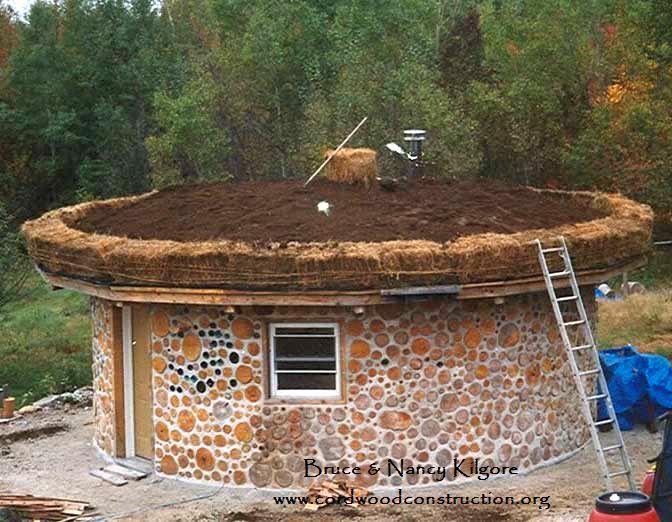 Notice the cordwood is notched and screwed to the post. 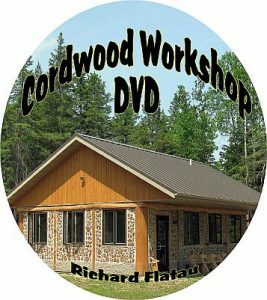 Bruce wrote an article about his wraparounds for the Cordwood Conference Papers 2005. The living roof is all most finished. The interior has beautiful bottle end motifs. This was their practice building before they built their lovely Ravenwood home. Bottle end beautiful! Can you see the smiling frog? Tom stops for a moment of reflection and a smile. Nancy works on the new house using double wall (the guest cottage is single wall). 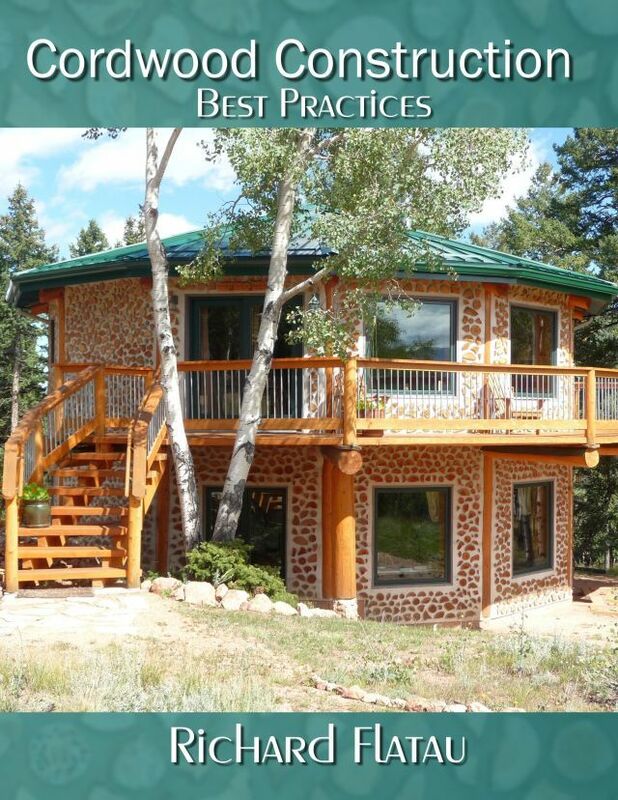 This exterior wall is 8″ thick with two 3 inch mortar beads and 2″ of sawdust insulation. 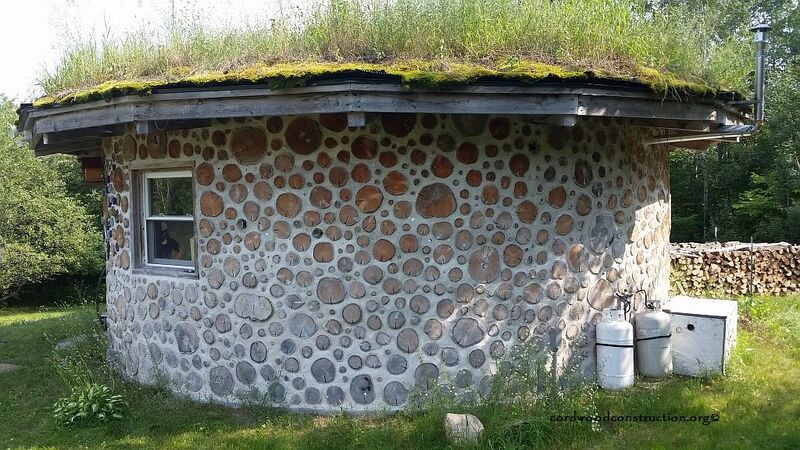 There will be 6″ of blown-in water based foam and then another 8″ of cordwood on the interior: producing a super-insulated wall. Bruce cranks up his cordwood chop saw. He has expertly modified the original Mother Earth News plans for this bad boy and made it much better. Tom Huber watches in awe. The other side of the guest cottage.